Ethan and I have been keeping up with the Toddler Time routine and I have to say I really do enjoy it. It's not only providing Ethan with knowledge, but it's also great bonding time that is fun! As a SAHM you would think that bonding time wouldn't even be an issue. I'm with him every minute right? It's true, I am. But sometimes, ok most of the time...I'm not 100% there. I'm folding clothes, getting dinner ready, paying bills...ya-da, ya-da. So it's nice to have a planned out time where he gets my 100% undivided attention. I clear my mind and my to-do list and it's just him and me having fun. I recently went to Jo-Anne's and the Dollar Tree to rack up on some "educational" supplies. There's a lot of crafty stuff I haven't put together just yet, but my shopping spree should keep us busy for quite awhile. One of the items I bought at the Dollar Tree was a packet of shape sponges. For $1 they are providing a lot of fun! In fact, Ethan even had the cashier open them up for him before we left the store. 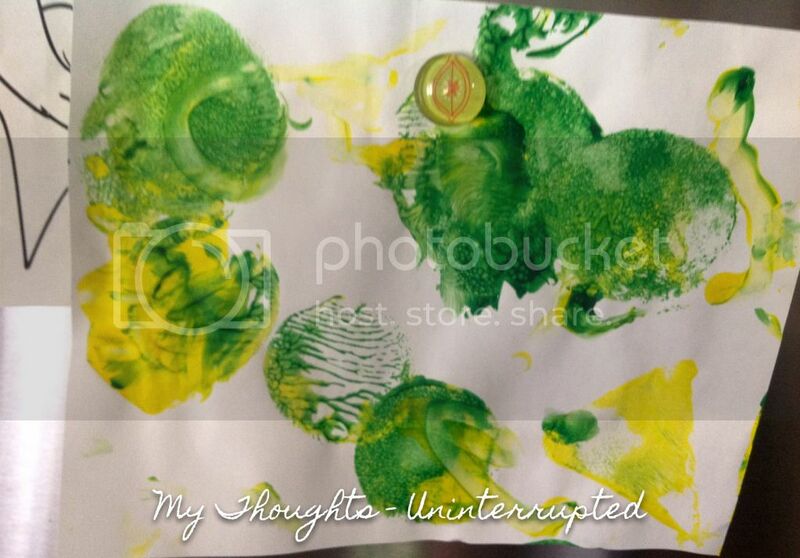 For this particular Toddler Time I used finger paints so that he could do a little sponge painting. We talked about the shapes he was using as well as which color paint he decided to dip them in. Yep. It's messy. Nope, it doesn't last long. And yes, of course the clean-up takes longer than the actual Toddler Time, but to me it's worth it. He's learning and he's definitely having fun. Plus it's providing me with some great fridge art! I've got a few more ideas for these sponges...like water sponge art on the driveway. Hey! There's a clean solution to Toddler Time right? He also plays with them at bath time sometimes which is another great time to teach since there aren't many distractions. I hope you guys are finding this series of posts useful. I know a lot of these ideas aren't mind blowing, but sometimes I find that it's the simple stuff we overlook. 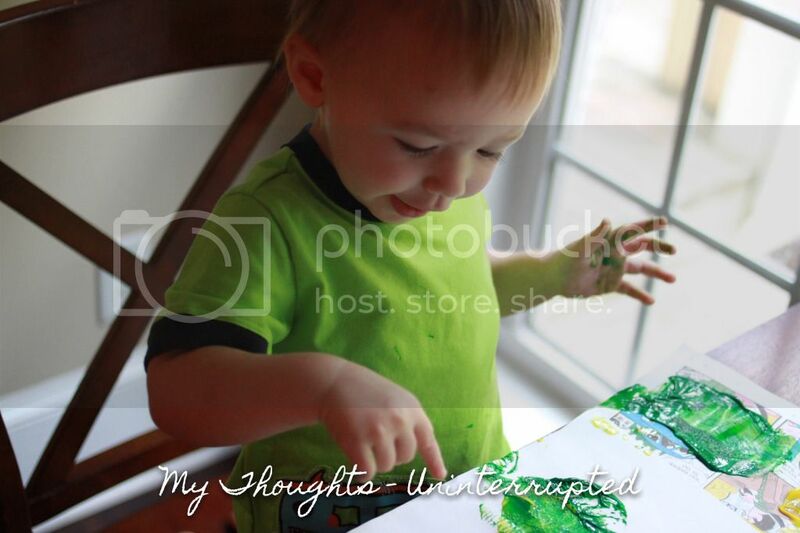 I was surprised by how many ideas I got from just the comment section of my first Toddler Time post. It encouraged me to revisit puzzles with Ethan (which I found he loved if I cut out all other distractions) as well as do a little more talking in our everyday life. We count the steps every time we go downstairs (he can now say numbers 1-5) and we talk about what color the traffic light is and whether it means stop or go every time we are on the road. Please feel free to share your thoughts and ideas in the comment section and make sure to come back to read others comments later on! You might get a spark of an idea, you never know. It's true that it takes a village to raise a child and I certainly appreciate this village and all the ideas and encouragement it has provided me with. What a cute toddler activity! And you're brave - I would have had that table covered end to end with craft paper! Looks like you guys are having a blast. Hope you and the bump are feeling great too! So fun! I have yet to do paints with Emmalyn. Yesterday I made play dough since it was so rainy and it was a success! Emmy really enjoys playing with stickers. I get the huge packs that are reusable--worth the money! We have the same farm puzzle... does yours randomly go off throughout the day, too?!! ;) I have found that separating Emmy's toys have helped immensely... I took out all her noisy toys from her room, leaving only books and puzzles; that way, when it's "quiet time" we can shut the door to her bedroom so there aren't any distractions (like you were saying). 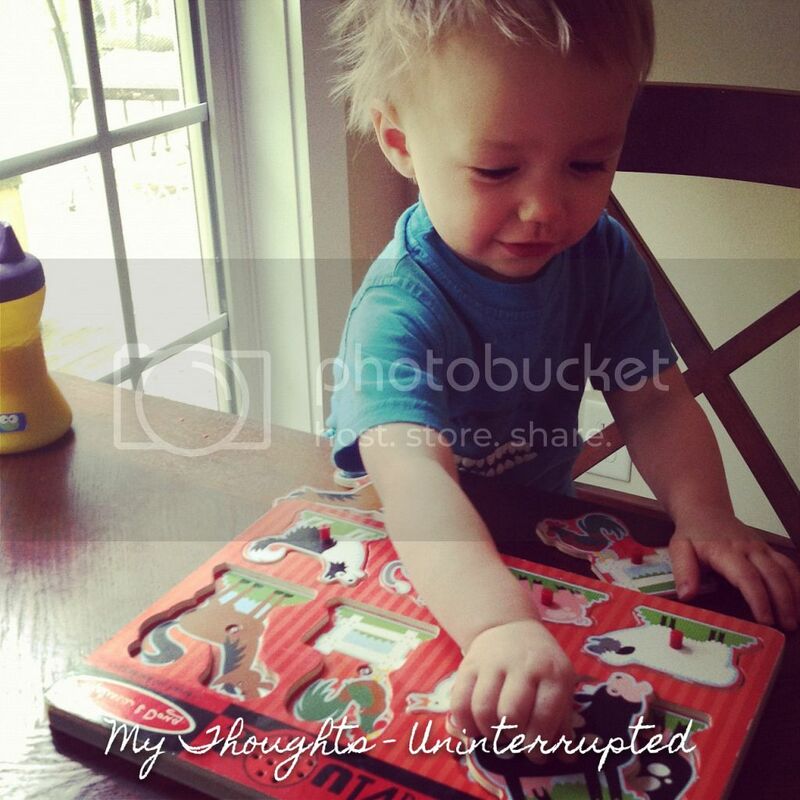 Didn't get to read your first Toddler Time post--off to do that now. Hope you're feeling well, pretty lady! I LOVE this...it looks like Ethan had a lot of fun playing with the sponges!! Puzzles and coloring are favorites in my house...as are random dance parties:) Hope you guys are having a good week!! Great ideas! I love the concept of toddler time. We also count the stairs each time we go up and down! Helicopters are HUGE over here so we use them for everything--colors, sizes, directions, anything I can think of! And of course Pinterest has been my go-to for ideas. I love that you are doing this and sharing it. I am just like you and find it best to carve out some time for these activities. I also find it makes a difference in his behavior when I really give him one on one time. Sometimes I think it "ruins" him though---that he can't play independently!! But it will all work out. Ok--long comment over!